One day as John is leaving the police station, he sees a hub-bub going on around the corner. What’s all the fuss about? Well it’s a goddamn fire, of course. A freakin’ COVERED WAGON is on fire. Why the f…where did a covered wagon come from? This isn’t Little House on the Prairie. There is no reason for there to suddenly be a covered wagon rolling through the middle of town on fire with no explanation. The fire of course, saps John’s strength for a bit and has he regains it, he suddenly hears a voice saying his Martian name: J’ONN J’ONZZ! He is immediately startled as he also immediately recognizes the voice as TOR, THE ROBOT CRIMINAL OF MARS. John recalls the tale of Tor, an indestructible robot built by Martian scientists to serve martians. Martian scientists by the way, are skinny nerds with giant glasses for some reason. Anyway, they make a terrifying robot to serve them and this plan has no way of going wrong until OH NO, ONE OF THE DUMB SCIENTISTS! The “master criminal thought-control card” is accidentally fed into Tor’s mechanical brain. Why do we even have that card? Tor absorbs the thoughts of criminals and then goes on a crazy crime spree across Mars, stealing everything he can. Thankfully our hero, J’onn still lived on Mars at this time and has a plan to stop Tor. He has them leak rumors of great Martian wealth hidden I guess inside this rocket ship. Then when Tor enters it, they slam the door shut on him, and launch him to the dead planet Turas, with J’onn mocking him on an intercom most of the way there. How did Tor even know J’onn was on Earth? What? John instead tricks Tor/Kirk into jumping out the window, a fall of about 5 stories, and is shocked to look outside and see that he is completely fine, and somehow being possessed by an indestructible dude has also made Kirk indestructible. Which, otherwise J’onn would’ve just let this robot guy basically kill this Kirk guy. A few hours later, Kirk is in an airplane trying to crash it down right on top of John. John uses his Martian lungs however to blow the plane into statue instead, crashing it. He figures if he can just avoid this dude for 24 hours, Tor will die and everything will be fine. That night at the docks though, he sees a girl drowning and jumps in to save her. BUT OH NO. IT WAS A TRAP. Tor tries to drown J’onn but as we saw in the last issue, that won’t happen. John tries asking him to stop. “C’mon man, you’re just a machine!” Tor is still pretty miffed though, and decides the best way to get revenge is to head to the newspaper and reveal that John is secretly a Martian. John is very set on stopping him, even though I don’t know what newspaper is going to believe a notorious criminal claiming that the city’s most prolific detective is actually FROM MARS. As Tor stomps to the newspaper office, John tries everything to stop him. Then! IDEA! 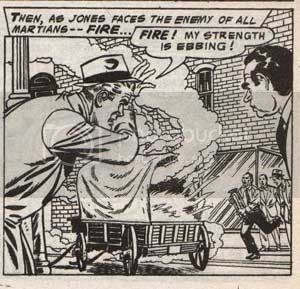 He sets a bunch of newspapers on fire, and the fire weakens him AND the Tor-possessed body of Marty Kirk! 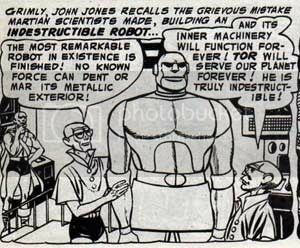 As he explains it, ALL MARTIANS are weakened by fire, even robot ones, and then I guess, even the human bodies the robot martians might be possessing? There are so many levels to this that don’t make sense. As the fire dies out, Tor dies too and Marty is free from the possession only to find himself being arrested by John. He IS a notorious gangster still.